Short introduction: Recetly some russian newspapers talked about airplane, lost in Moscow Sheremetevo airport. And this airplane was claimed to be full of Euros in cash, up to 20 billions (20 000 000 000, 200 wooden pallets with €20bn in €100-notes). There are some english versions of the story: b.insider, news au, rtbh or just google for koroorian motlagh or Farzin Motlagh. also referenced here: The €20bn mystery: Could Iran be the owner of huge cash stash at Moscow’s Sheremetyevo airport? США и Иран дружили, а американцы покупали у иранцев нефть. В начале 90-х американцы устали перевозить им доллары (Иран признавал только наличку) и предложили: давайте мы отправим вам двух офицеров Федеральной резервной системы США вместе с печатным станком, дадим клише, и вы будете печатать себе доллары сами. Сколько нефти поставили, столько и напечатали. Эта схема работала до того момента, пока ядерная программа Ирана не стала мешать США. Американцы тут же расторгли все договора и забрали станок. ... Тогда иранцы стали думать, что делать с этими долларами, а было их шесть триллионов. There is additional claim in russian text: "(Iran accepted only cash)"
Then the claimed scheme was stopped due to Iranian nuclear program, and money was converted with help of Russia, Germany and Italy. Dollars were converted into euros in Frankfurt. USA payed Iran in cash for petroleum. It is possible to USA to send FRS officers and dollar-printing machine to other country. Even to Iran? It is possible to print 6 trillions dollars outside the USA. USA payed Iran in cash for petroleum ? So all the trades are made in US dollars, however I cannot verify if it was made in cash. This is not verifiable, everything is possible, the questions should be formed as "has it ever happened ?" And if it is, I have found some sources that suggest it might be true, but I cannot confirm it completelly, since I cannot find original references. It is possible to print 6 trillions dollars outside the USA ? The third world is the playground of the bogus C-note. The United States Secret Service said $248 million in counterfeit American currency was seized outside the United States last year, compared with $73 million seized domestically. This is for 1994 - we can speculate how much counterfeit dollars are out there in circulation. There was approximately $1.21 trillion in circulation as of September 11, 2013, of which $1.16 trillion was in Federal Reserve notes. So I have a hard time believeing that 6 Trillion ! have been printed in Iran alone. In my analysis below I can only get a figure of 12 $ Billion annualy. There is no better evidence that can support this claim. This is such a long story so it is impossible to explain what exactly happened. I cannot confirm if plane is real or not, this is another research story. It seems to me that the article is wrong - it states that the printing of money has only started in the 90-s and ended with Iran nuclear ambition, but this is not the case. The sources that I found so far states that by 90-s Iran and US were clearly not friendly. Since The 1979 revolution and The 1979 Iran hostage crisis their relationship has been getting only colder. But Iran and US were friends since 1953 Iranian coup and possibly shared printing equipment but this is something I cannot verify beyond few sites like that and that. This quote referes article in New Yorker, but I cannot verify this since access is locked. A joint Iran-Syria conspiracy to counterfeit U.S. dollars, purportedly in order to strengthen Iran's economy and weaken the United States. "The fact of the matter is that the Iranian government, in cooperation with Syria, has undertaken a massive counterfeiting campaign in order to alleviate their financial difficulties and pursue economic warfare against the West," Representative Bill McCollum (Republican of Florida) said in a July 1 news conference. "The Iranians last week outraged me personally when they put in their official publication the statement that this counterfeit money was being produced by the United States 'intelligence community' and distributed over there," McCollum said. "That's hogwash." DMINATOR, Can you add oil price graph to estimate how much oil export per year costs? 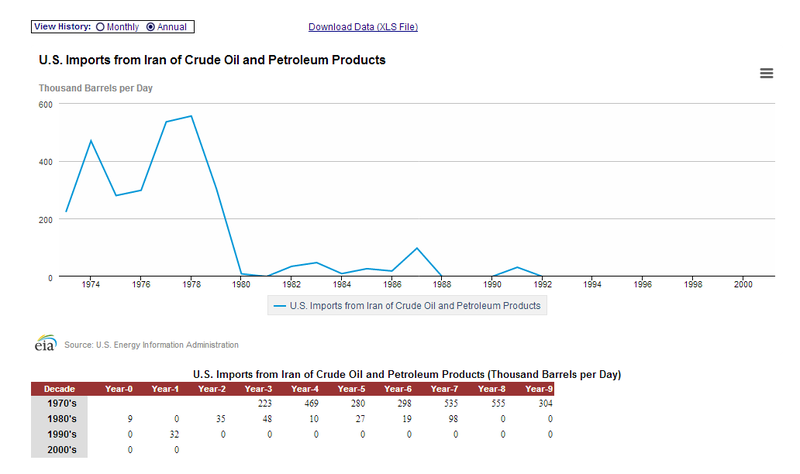 Combining the graph in DMINATOR's answer with the graphs on http://www.wtrg.com/prices.htm allow an estimate of the value of US oil imports from Iran. Average 500,000 barrels/day from 1970 through 1980 = 2*10^9 barrels/decade. Cost of oil $75/barrel => 150*10^9 (one hundred and fifty billion) dollars/decade. So "six trillion" seems improbably high: by at least one order of magnitude. IMO that falsifies one detail of the claim (although the "20 billions" in question is only a small fraction of 6 trillion). Not the answer you're looking for? Browse other questions tagged united-states economics iran .